There are few things that I knit that I fall so deeply in love that I find the lamest excuses to pull it out (and this has been a HOT summer). My purple Hitchhiker is one. This is the other. The first reason is the yarn. I’m a Malabrigo addict. Their yarn is so beautiful and so touchable (it doesn’t hurt that my local yarn shop owner says they are the nicest people to work with). I use Malabrigo yarn a lot (it’s my go-to) and I ended up getting this beautiful wine/purple yarn during the Minnesota Yarn Shop Hop last year. I wasn’t interested in All About Yarn’s special Hop yarn but while looking around I found this beautiful cowl made from this yarn on display. It’s one of the few times I saw a sample and grabbed the pattern and yarn without even considering if I’d even wear it. Oh, I would wear it. Well done, display knitter! This color is fantastic and the yarn is so soft. 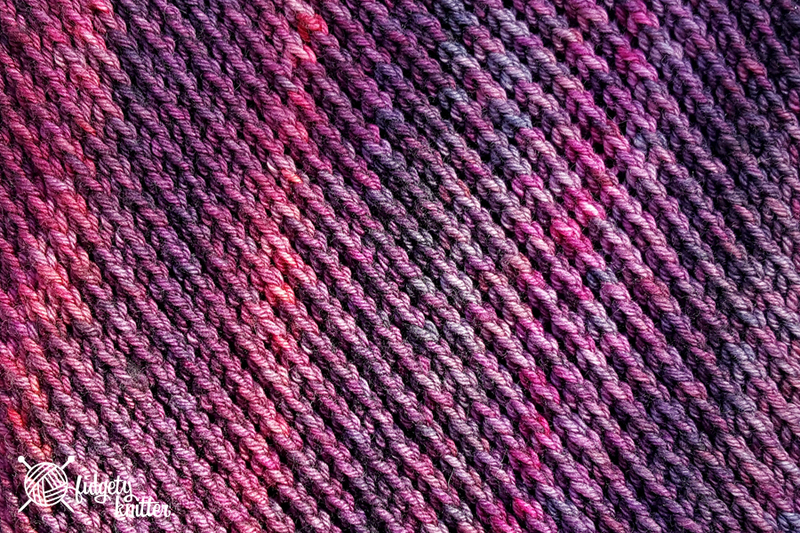 This project took two skeins and while I purchased the same dye lots, there is a definite color shift. I’m not even mad. The stitch texture is really lovely, too. This cowl is SUPER stretchy because it’s just yarn overs and knit two together. But the number cast on causes the pattern to travel on the bias. Combined, those give the Tetra 2 Cowl a very interesting texture. As long as you remember YO, K2TOG in the correct order this is a very simple pattern. 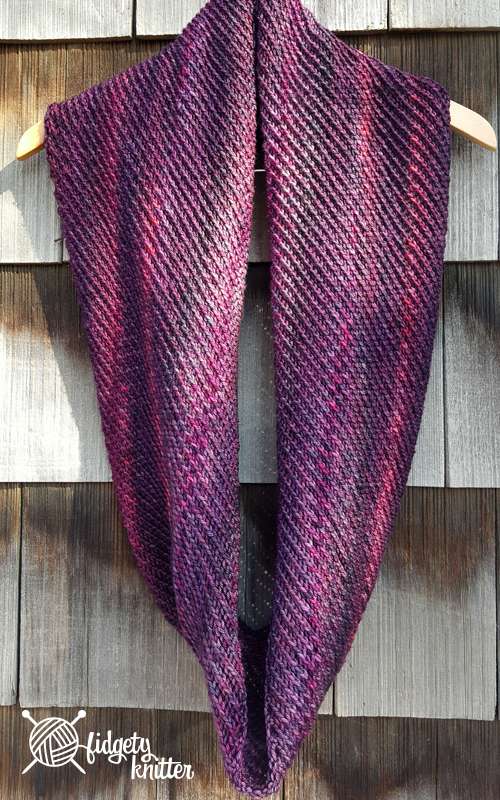 Called Tetra 2, this is a longer version of the Tetra Cowl (it doesn’t look like the Tetra 2 pattern is available on Ravelry). Based on the notes with the pattern, apparently some people will forget where they are in the pattern. I found if I only ever set the project down after a K2TOG, then I always knew I would always start with a yarn over when I picked it back up. Knit in the round on US 9, the most boring part of this project was casting on a zillion stitches (and then casting off that many). You can make it wider by adding in more yarn. I only used two skeins of Malabrigo Rios super wash and feel like this is the perfect width. The color is called Purpuras. Holy COW I love this yarn. 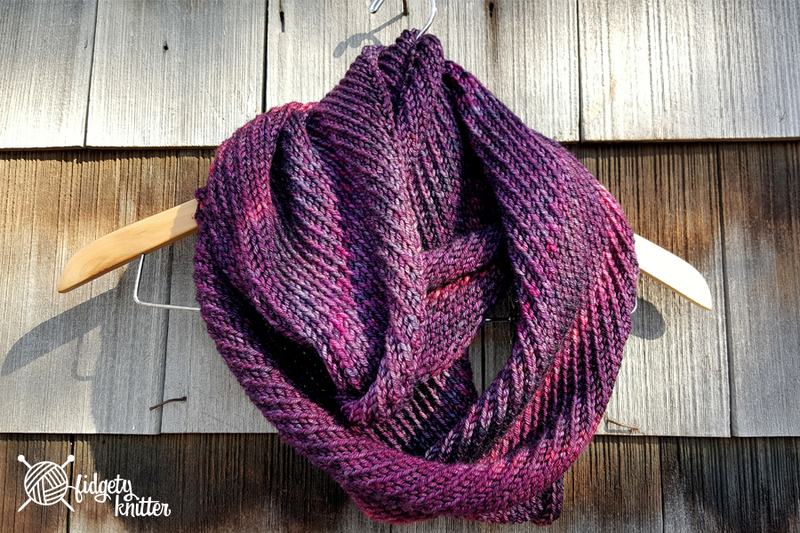 This cowl is so long and squishy that it’s perfect for cold days snuggled around my neck. If it gets cool enough, I could wrap it twice and use part of it as a hood. I don’t wear hats so I love the idea of a warm, smushy wrap hood this winter. For this project, I used the Twisted German Cast On. It’s a stretchy long-tail cast on that gives a lovely braided edge effect. I cast off with a stretchy bind off that I love (which also gives a lovely braided edge). Both of these are my go-tos. The Tetra 2 Cowl is a super simple project and knits up very quickly. The end result is a beautiful piece that I will get a lot of wear out of this winter. What projects are you working on right now? Let me know in the comments and don’t forget to share pattern links!